The myth we´ve all fallen for. This episode is for you (or someone you know). Because let's face it, today more than ever, there are So. So. Many. Things competing for our attention. Do you have days, weeks or months where your to-do lists seem like an unconquerable mountain? Do you sometimes get overwhelmed by work, running your business and the obligations of life? Had so much on your plate that checking email obsessively every 10 minutes, or refreshing your social feed seemed the better option. On those days the temptation to catch up on my favorite show is HUGE. My reasoning being at least if I watch one episode, I can mentally tick it off as one thing done and move on to the next one. Only that's not how it goes. IF I succumb to that procrastination temptation, I never stop at JUST ONE episode. Not good. Hello, guilt...Because watching season 3 of Homeland was not on my to-do list. It´s on the reward column as the reward for getting stuff done. Netflix anyone? Anyhow, so the other day my computer was acting hot and sluggish. It´s summer here in Germany. While sorting the I-hate-slow-computers problem out (with ice cream on my mind), I had a eureka moment! I got a revelation about time management. To use one of President Trump´s favorite words - it was HUGE! (OK, it´s hot and when temperatures cross 30 degrees - I wax philosophical and stuff). And no. Didn't vote Trump. I´m an African based in Europe, born in Kenya. Near the equator. It´s not this humid in Nairobi. But I digress. Want to discover why that's not working despite that new planner or app you thought would save the day? 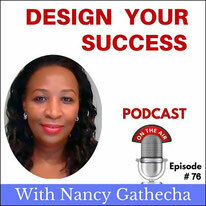 Tune in as I share what to do instead if you want to get stuff done. 5 simple tips to help you avoid or tackle overwhelm. What your computer's performance has to do with your success and efficiency. What to do if you want to stay on track with your vision for 2017. Why some people fail to achieve their goals. Despite action and a good work ethic. How to avoid burnout when working on your life and business goals. Why am stopping podcasting and more. As my valued listener and reader, you´ll also hear how to be one of the first to get a FREE copy of my new book. Enjoyed this post? Subscribe here for free updates and exclusive content. Limited free copies will be available. What are your thoughts on time management?